Sharp “kyik.” Drumming increases in tempo towards the end. Description: Solid black back; white underparts; heavily barred sides; narrow white line behind eye and wide white mustache. 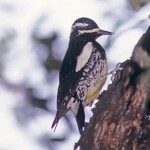 Male told from female by solid yellow cap. 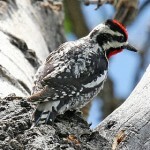 Habitat: Coniferous forests, especially in burned over areas. 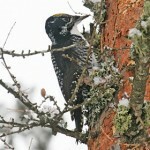 Forages on dead conifers by flaking away bark rather than drilling holes. Where in Nebraska: Accidental. Three early records from Douglas and Dakota County, and reported in Custer County in 1970. 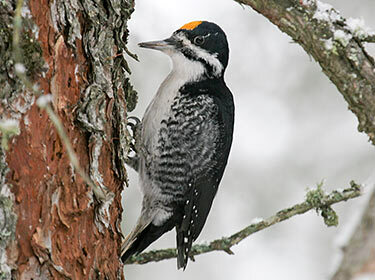 Fun Facts: Black-backed Woodpeckers prefer burned forest areas where the insect community is dense after a fire and their all black back will blend in well with the burned trees.